Christmas is all about the parties, but if you’ve been roped in to arranging a children’s Christmas party, you may be feeling the strain. Children’s parties have moved on a lot in recent years and expectations are a lot higher – at the very least your guests will expect there to be some organised games and entertainment. If you’re looking for a festive children’s entertainer in Kent or the surrounding areas look no further than Marky Mark Entertainment. With many years of experience as a professional party DJ, including DJing at successful kids’ club nights, Marky Mark specialises in children’s discos. But these are not your ordinary, bog-standard discos with cheesy tunes and a few flashing lights. When it comes to what’s hot and what’s not, Marky Mark has his finger firmly on the musical pulse. As well as playing the latest tunes that are firm favourites in the playground, Marky Mark will also play a classic mix of party tunes and choreographed dances (think Gangnam Style and The Macarena), as well as throwing in some Christmas songs to get your party-goers in the festive spirit. And if that’s not exciting enough, you could liven things up with one of Marky Mark’s Glow in the Dark parties. Hugely popular with the over-nines, these discos with a difference combine a traditional disco experience with neon paints and UV lights to help your guests get their glow on. You could even up the fun factor with extras such as a bubble machine, dry ice, or a very seasonal snow machine. The music may be great but you need a little more than just a good disco if you want to keep the energy up and your guests entertained. Luckily, Marky Mark is also able to deliver in this area. Little party guests can enjoy a whole host of fun activities, including magic shows, balloon modelling and puppet shows. Meanwhile older children are catered for with exciting party games, including boy vs girl competitions, disco dance championships, the mummy game, limbo, and lip sync battles. They can also exercise their vocal chords with karaoke and Marky Mark’s very own version of the X Factor. And don’t think about sneaking off while the games are going on, as adults are most definitely encouraged to join in the fun. When you’re organising your Christmas-themed children’s party, don’t forget to include those festive treats that will make your event extra special. Marky Mark Entertainment has all those little extra touches covered, from face painting and popcorn to candyfloss and custom sweet cones. As it’s Christmas you could even ask Mark if he’s able to arrange a visit from Santa Claus himself – a special touch that is sure to delight your young guests. Organising a children’s party needn’t be difficult, and hiring in professional entertainment can really help to take the stress off. 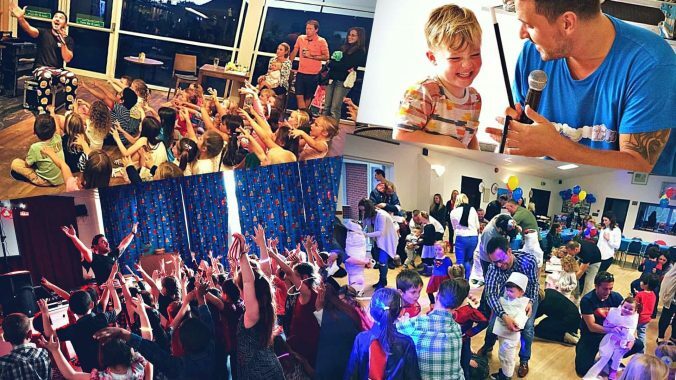 As well as offering a comprehensive children’s entertainment service, Mark and his employees are all DBS checked and fully insured so you can be sure that your party, and your little ones, are in safe hands.